Naruto 665 is the next most awaited Naruto Shippuden manga chapter to be released this coming Wednesday. We expect a lot of exciting things to happen in this chapter now that Rikudou Madara has arrived to were the Black Zetsu and Kakashi and Minato are. In this chapter we hope that some of our questions will be answered like; will Madara finally have his left Rinnegan eye back, what will happen to Naruto now that the Black Zetsu captured the other half of Kurama, will Kakashi get the other sharingan eye of Obito and what will Tenten do with the treasured tools of the Sage of Six Paths that Rikudou Madara spat out? Let’s find that all out in Naruto chapter 665. UPDATE: Naruto 665 is now available. Naruto Chapter 665 is entitled “The Current Me”. There’s no action in this chapter, just a bunch of conversation and history telling from Madara. Don’t wanna spoil you much, but Obito is still alive and he is going to do what a Hokage is supposed to do in their situation. I have several predictions for Naruto chapter 665. Some of these predictions might be far fetch but I’m not Kishimoto and anything could happen unexpectedly. Let’s discuss them one by one. Last chapter, it was focused somewhere in the middle of the chapter that Rikudou Madara spat out two Treasured Tools of the Sage of Six Paths. These tools are the Kohaku no Johei and the Benihisago. These were the same tools that the Gold and Silver Twins used before. How did it get into Madara you ask? Obito used them as a replacement for Kurama’s chakra to awaken the Bijuu. The Gold and Silver Twins got some chakra of Kurama when they ate Kurama from the inside long time ago. Since the twin brothers were trapped inside the tools, it contained some of Kurama’s chakra. Madara has no need for that since he was able to absorb Kurama (Naruto’s Kurama), and I think this will be his biggest mistake yet. I think the tools could either be used in two ways. If the treasured tools still contains some of Kurama’s chakra they might be able to use it and heal Naruto somehow. Or Tenten (and not Naruto hehehe) would use it to seal Rikudou Madara for good, finally ending the war. Until now, the mysterious bare-footed man that is approaching Sasuke is still unknown. But Karin did mentioned that she sensed a negative energy, something that is dangerous and that they must hurry at all cost, or it will be Sasuke’s end. While Minato was trying to transfer the other half of Kurama to Naruto, the Black Zetsu suddenly interfered and captured the other half of Kurama. Now the enemy has both Kurama and this could be fatal to Naruto. How the heck are they going to save Naruto now? 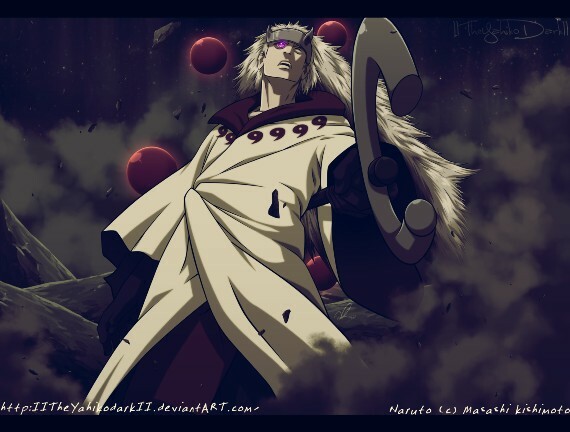 I guess Minato, Gaara and Kakashi will have to face and fight the Black Zetsu and Madara. If the Black Zetsu merged with Rikudou Madara, Madara will be complete, with 100% of the Kyuubi’s chakra and both Rinnegan eyes. He will become so unbeatable that everyone might die after this war. Of course we know that it won’t happen for sure. Most probably not. The title of this series is Naruto Shippuden right? And not Madara Shippuden. I’m guessing that after a fierce battle Naruto will regain 100% of Kurama and he will become strong enough to defeat or seal Rikudou Madara. Will Kakashi Get Obito’s Other Sharingan Eye? One last thing, will Kakashi get Obito’s other Sharingan eye? This sounds far fetch already. But if the Black Zetsu leaves Obito’s body, he might still be alive just enough to say his final words to Kakashi and entrust his other Sharingan eye to him. With both Sharingan eyes, Kakashi might be able to delay Madara somehow and save Naruto. Well, these are just my observations and predictions. Some of them might happen, some of them (or all of them) might not happen. I’m really excited to see what will happen in Naruto 665. As of today confirmed Naruto 665 spoilers are not available. And usually they aren’t leaked anymore. Let’s just wait for the chapter to be released, anyway there were no announcement that Naruto chapter 665 would be delayed.